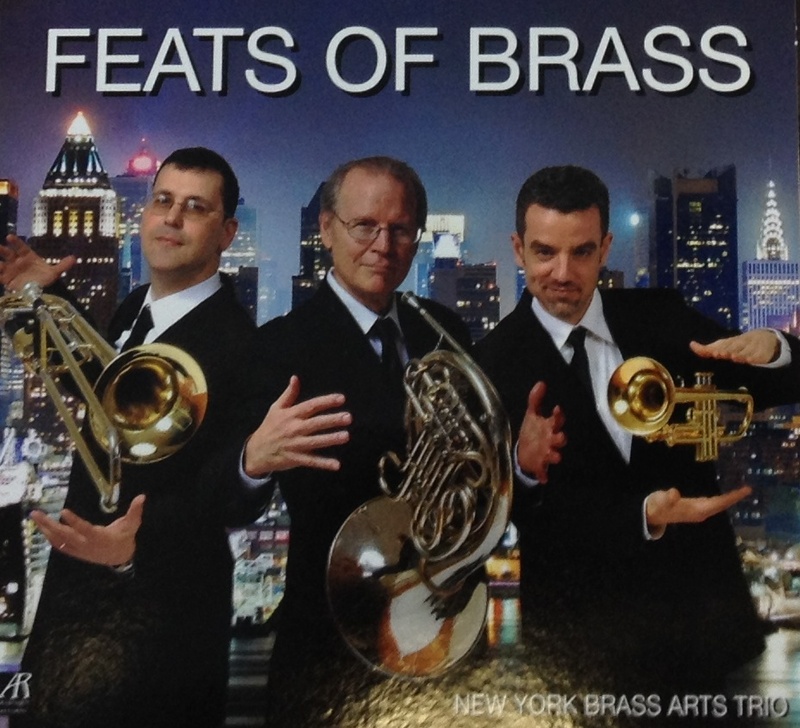 This week’s review will take a closer look at Feats of Brass, a fantastic new recording on Arabesque Records by the New York Brass Arts Trio. The ensemble is composed of three world class musicians, David Jolley (horn), Joseph Burgstaller (trumpet), and Haim Avitsur (trombone). The performers themselves don’t really need any introduction, so this review will instead focus on the recording itself. I got my hands on this album in an unconventional way. While searching for brass trio arrangements online, I came across the group’s promo video. I immediately liked the arrangements, and contacted Mr. Jolley to see if they were available to purchase. Despite what must be an intensely busy performing and teaching schedule, Mr. Jolley was gracious enough to correspond with me. I ended up buying two of his arrangements from the album, Bartok’s Romanian Folk Dances, and the Chaconne from J.S. Bach’s Partita in D Major for Solo Violin, BWV 1004. In addition, he sent along a complimentary copy of the CD. As of this writing, the album is unfortunately not available on Amazon or iTunes, and does not show up on the Arabesque Records website. However, I’m sure it’s just a matter of time, and when it does become available you won’t want to miss this recording! All of the works are new arrangements by the members of the ensemble. For now, you can check out the promo video linked to above, as well as hear some samples at the group’s website: http://www.reverbnation.com/NYBAT Here’s the track listing, with a few words about each one. J.S. Bach/arr. Jolley: Chaconne, from Partita in D Major for Solo Violin, BWV 1004 This nearly 15 minute tour de force works surprisingly well for brass trio, provided that all the players have the technique, endurance, and maturity to pull it off. Even though the solo violin part is split among three players, the technical demands are still considerable. The trumpet and horn parts are worth special mention because of their virtuosic nature. Beethoven/arr. Avitsur: Trio, Op. 87: Originally for 2 oboes and English Horn, the Robert King arrangement of this substantial work has become a staple in the brass trio repertoire. Those familiar with the old R. King edition will hear many similarities with Avitsur’s, but with a few nice surprises along the way. In some cases parts have been taken up an octave – perhaps to match the original scoring? – and in others articulations have been changed from slurred to tongued. Combined with the brisk tempo of this particular recording, the overall effect is a sparkling, virtuosic take on this classic. Bartok/arr. Jolley, Romanian Folk Dances: I didn’t know much about this work prior to hearing the recording, but this arrangement is well deserving of a place in the brass trio repertoire. Originally for piano (and later arranged by the composer for chamber ensemble), these short dances are full of style and character. Playing them “straight,” simply won’t work, and in that respect they are similar to Chopin’s Mazurkas and Polonaises. Despite only having three voices to work with, Jolley’s arrangement creates rich, orchestral brass sounds. We’ve read through this piece in our own faculty brass trio, and it is very rewarding to play! Piazzolla/arr. Burgstaller, Libertango: I know of at least one other brass trio arrangement of this very catchy tune, but Burgstaller’s certainly raises the bar in terms of virtuosity. As with all of the other works on this album, the performers make even the most difficult passages sound effortless. It is a fitting conclusion to a very impressive recording. Although the brass trio repertoire is not nearly as large or varied as that of the brass quintet, there are a growing number of original and arranged works which are helping to bring greater exposure to this medium. Additionally, a handful of top notch ensembles like the NY Brass Arts Trio are creating, commissioning, and otherwise championing new music for trio. It is interesting to note that while the brass quintet is considered a standard medium today, it has only been since the 1950s that it has become widely recognized (with the obvious exception of Victor Ewald’s quintets). This recognition was due in large part to the efforts of another New York-based brass group, the New York Brass Quintet. If brass trio music interests you, be sure to check out some of these other articles by yours truly.